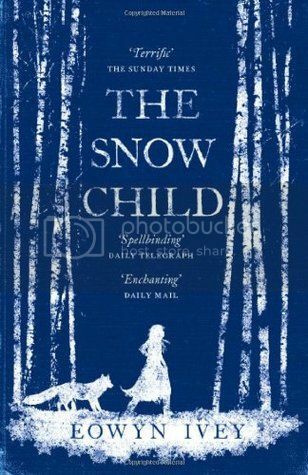 I've seen The Snow Child by Eowyn Ivey in bookshops for a long while, and that beautiful cover has always caught my eye. More than once I have picked it up to read the blurb, and yearned to buy it. But I was always put off by the fact that it's historical fiction, a genre I don't really get on with, and the literary feel to the story, a style I tend to shy away from. When I saw that The Snow Child was available for review on Bookbridgr, I immediately requested it. A chance to give the book a try, with an incentive to make myself read it - the fact I have to write a review. Now, I so wish I had picked it up the very first time I saw it, because it's ineffably beautiful. Jack and Mabel, a couple of middle-years, moved to rural Alaska to make a new life. To have their own farm, and leave behind the past, and Mabel's failed pregnancy. But life there isn't what they thought. Work on the farm is hard with very little reward, it's quiet and solitary, and their grief haunts them. When the snow arrives one winter, Mabel is filled with a childish joy, and Jack humouring her, together than build a snowman, and make it a snow child. The very next day, the snow child is gone, and so far the scarf and mittens Mabel put on her. Later, Jack sees a lone child running amongst the trees, wearing Mabel's scarf and mittens. Jack and Mabel are at once over-joyed to have young Faina come into their life, but weary. Where did she come from? Where are her parents? And why is Mabel too quick to remember, and take stock in, a Russian fairy-tale of a child made of snow? The Snow Child is an absolute wonder. It's a heartbreaking story, but one full of hope and love. It's not a story of explanations, it's one of belief, of putting aside questions and just accepting, one of immense gratitude and joy. Faina comes into the lives of Jack and Mabel when things are at their lowest. The farm doesn't look like it's going to work, and Jack is getting too old to be doing all this hard work on his own. Mabel is in the depths of despair, weighed down by the guilt of being unable to bring her baby to term, and the ineffable sadness that they remain childless. Her depression knows no bounds. But then Faina appears out of the wood, an angel in the snow, and turns their lives around. There is something about Faina, the way she appears and disappears, how nobody else has ever seen her, how there are no speech marks when talking to, or in the presence of her, that makes her feel imaginary, a fairy, a ghost. There is an unreal quality to her, which causes Mabel and Jack to hold on to her even more tightly, in case she disappears. She's their miracle, and brings magic to their home through light, love and laughter; happiness and joy. There is this enchanting fairy-tale feel about the story, that makes sense as the story is inspired by various versions of the same story; Snegurochka (The Snow Maiden in English), a Russian fairy tale, The Snow Child retold by Freya Littledale, and Arthur Ransome's Little Daughter of the Snow. The Snow Child takes elements from each of these children's stories to create a beautiful retelling. It's a novel to be enjoyed by adults, but has the awe and wonder found in a fairy tale, by weaving in this magical realism. With fiction, especially fantasy, you can quite easily believe what you're reading, as long as there's a credible back story, despite knowing the stories couldn't happen in reality. With The Snow Child, you're never completely sure whether Faina is a child made from snow or a real child. There are hints throughout the story that could make you think either. The are times when you think she must be human, but other times where her being human makes no sense. As I said above, it's a story of putting aside questions and just accepting - not just for Jack and Mabel, but for the reader, too. We're never given a definitive answer, and in it's way, the story allows you to form your own interpretation - is Faina real or is she not? The title suggests heavily that Faina is, in fact, made of snow, but I think that's more to do with Mabel; when Faina arrives after their snow girl disappears, wearing the scarf and mittens, Mabel remembers the story of Snegurochka that her father told her as a child, and makes a link between the two. A fancy of a woman who so desperately wants a child of her own she believes a fairy tale has come true? Or in fact the impossible made possible? What's wonderful - and brilliant of Ivey - is that through a letter from Mabel's sister, Ada, which she sends along with the copy of Snegurochka Mabel requested, Arthur Ransome is mentioned. He is a student at the university which their father worked at, and is very interested in the story and had borrowed the book. I can't review this book without discussing the setting. There is a harsh and brutal quality to the landscape of 1920s rural Alaska. It's not soft, it's not traditionally pretty; it's remote, hard with sharp edges, ferocious, at once scary yet awe-inspiring. It's hard work living there; there is no ready-made farm, Jack has to fell trees of the wood, and then toil frozen earth to get the soil ready for farming in the Springtime. It's back breaking work in the freezing cold. The environment Jack and Mabel live in works, though; we learn in school about pathetic fallacy, where the weather reflects the mood of a character - well, with The Snow Child, the landscape is almost a reflection of the despair and sorrow the couple still feel over the loss of their stillborn child ten years before. They are still grieving, and a distance has grown between them because of their grief. And the mood isn't helped by the fact that life here is tougher than they thought it would be, due to the environment. It's cyclical. And yet, this isn't a story that could be set in a nice, happy setting; a pretty little snowy village town where everyone is happy and ready for Christmas... Faina couldn't exist there, because her soul, her very essence is at odds with the world she lives in, in Alaska. In a pretty little snow village, her existence, though strange, wouldn't seem as miraculous; something wonderful happening somewhere wonderful is too believable, less fantastic. It's the stark contrast between the ethereal Faina and the savage terrain that allows Faina to be inexplicably enchanting. 1920s rural Alaska is pivotal to the mystery and magic that is Faina. And again with the environment reflecting a character, and also the story, there is a quietness to The Snow Child, like the hush brought by snow, the almost holy, not-quite-silence of a dark wood, that matches the quiet of Faina and her enigmatic temperament. There is so much more to this story, I've barely scratched the surface. I could go on and talk about how beautiful this book is for several paragraphs more! The story spans years, and there's wonder to discover on every page, but wonder you should discover for yourself. In my edition of The Snow Child, Arthur Ransom's story Little Daughter of the Snow is included. It's a sweet little tale, and I can see how it inspired Ivey, but I have to say I much prefer Ivey's mesmerising and enchanting retelling.I am so, so glad I read The Snow Child, and I can see myself reading it again and again.